Here you can explore updates to the State Government's 30-Year Plan for Greater Adelaide. First introduced in 2010, the plan outlined directions and policies that would shape our city's future. Seven years into the plan, it's time to address new opportunities and challenges to ensure Adelaide continues to inspire, excite and remain one of the most liveable cities in the world. It is now your turn to shape our city! The State Government has identified six high level targets that will guide policy direction in the short, medium and long term. Click on a target to explore its relevant updates and what they will mean for the future of our city. 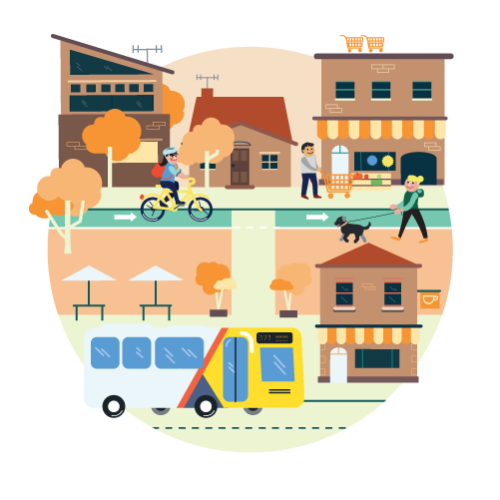 If you want to keep up-to-date with news on Living Adelaide, you can subscribe to the SA Planning Portal Newsletter, linked to the Stay Informed box at the bottom of each page. As living patterns change, our local streets will become thriving hubs of commercial and recreational activity. Creating public places where residents can meet, walk and enjoy their time is essential. Healthy, walkable neighbourhoods are places where people can live, learn, work and play. They offer a wide range of services that can easily be reached on foot or by bicycle, including schools, healthcare, shops, parks, sports facilities and public transport. They also provide streets and multi-functional public spaces that connect people with nature and support social interaction. *Established urban areas, including townships, in Outer Metropolitan Adelaide. More affordable, close to public transport, open space and local services will be encouraged. Greater emphasis will be placed on providing quality public open spaces that can support a diverse range of activities. Our streets will also be designed to better complement those walking and cycling.